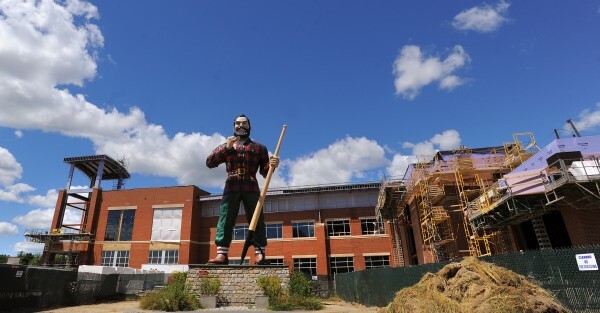 The $65 million Cross Insurance Center in Bangor is slated to open Labor Day weekend 2013. BANGOR, Maine — While the stagnant economy is no boon to most, it is paying some unexpected dividends to the city of Bangor. Wednesday’s Bangor City Council finance committee meeting had councilors beaming over a much lower-than-expected total debt service cost for Bangor’s new civic arena and events center. “We estimated our annual debt service initially at $3.7 million per year for 30 years, but thanks to historically low interest rates, Bangor’s good credit rating, and more interest than expected on our debt service for the arena, it’s going to be $2.99 million,” said Bangor Finance Director Debbie Cyr. That computes to an annual savings — or lower-than-estimated debt service cost — of almost $750,000 a year. The five councilors — Pat Blanchette, Nelson Durgin, Joe Baldacci, Geoffrey Gratwick and James Gallant — who are members of the finance committee could hardly wait to sign off on the deal. Cyr said the overall initial debt service estimate, which was done back in November, was determined based on our revenue received from downtown TIF [tax increment financing] funds and gaming revenue from Hollywood Casino. “That’s how we arrived at our $65 million estimate for the arena,” she said. Cyr said besides historically low construction costs and interest rates, the arena project benefited from greater-than-anticipated interest and competition among investors for Bangor’s debt service. Apparently Bangor’s debt is even more attractive than Cyr dared to hope. “We actually have 10 bidders for our debt service, but we didn’t expect that many, only because of the scope and cost of this project, which we don’t do very often,” she said. Baldacci said he hopes citizens realize this is further proof of the increasing value of the newly named Cross Insurance Center.